Revolution for Dogs and Cats has been designed to protect the pets from a wide range of parasites. This is FDA-approved, it is manufactured by Bayer to provide pet owners with an easy, safe and effective way to treat the pet with pests, worms etc. This product is a topical solution, with active ingredient Selamectin. When this solution is applied to the pet, it seeps through the skin into the bloodstream. Revolution for Dogs and Cats present in the blood, prevents and treats hookworm, roundworm infections as well as controls heartworm infection. It distributes through the blood, into the skin and other tissues, to protect and treat your dog and cat against fleas, flea eggs, ticks, ear mites etc. Revolution is formulated for dogs and cats. There are different color packs to be used for dog and cats. You need to weigh the pet and choose the pack according to weight and species. Do not use the same pack for dog and cat. There is a difference between the Revolution for Cats and the Revolution for Dogs. They contain the same ingredient, but the main difference between the two types of Revolution is the concentration of Selamectin in each dosage is different. Animals which weigh more, such as young animals and small breeds require a lower concentration, while larger cat breeds and dogs need a higher concentration. There can be problem, if you use the lower dosage on a large dog, as it will not provide complete protection. And if you use high dosage on your pet, it will cause health issues. 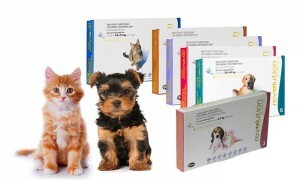 So, it is important to follow the instructions and give the right dosage according to the pet’s body weight and type. Revolution packing is color coded and labeled clearly with weight categories and on which species it should be used. Mostly the vets advice that you should always use the appropriate Revolution for Dogs and Cats Treatment to avoid possible problems.